Let's see... my goals for 2016. Turn yarn/fabric stash into finished projects. I figure I should cut down my stash in my closet. 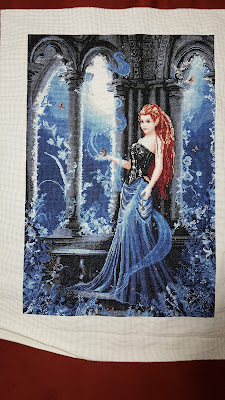 Yarn/fabric is bulkier and heavier than my cross stitch so I may concentrate on those.Get back to dancing. Which should help improve my unmet goal (2) from last year.I will get back to insanity. But the height of my bed plus my new lamp hasn't made working on GK's easy to use the magnifying glass.Learn to knit. Yeah, didn't happen.I did this for about 9 months. Then I bought the apartment and couldn't afford both.Not quite. My new stitching place is the right height, but I need another pillow to keep my from sliding away from the arm.Nope. Didn't have the time. I have all the materials I need but never quite got around to it. I did however finish 12 crochet projects, 4 cross stitch projects, and 2 I'll categorize as other. Not bad for having a full time job again. So I managed to finish the presents I was making. don't have a finished picture of my dad's basketweave blanket although I finished that while at my parent's house. Merry Christmas. Onto my next project. 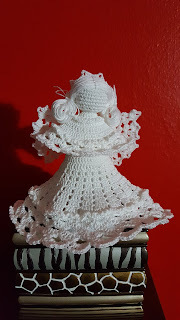 I spent the week working on the angel in thread crochet. 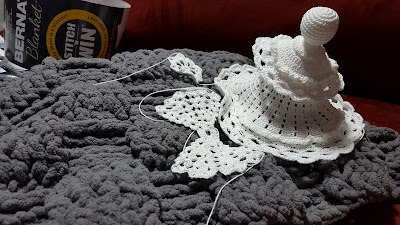 Today I worked on a lapghan in blanket yarn. Big difference in size. In the Garden is finished! And I decided to take a picture of my new craft closet (of doom). Not everything is in there. There's still a few boxes on my floor and the various bins that were in other closets at my parents. And all sewing patterns are elsewhere.